Buddhism is widely known to advocate a stance of total pacifism towards all sentient beings, and because of this, it is often thought that Buddhist doctrine would stipulate that non-violent food practices, such as vegetarianism, be mandatory. However, the Pāli source materials do not encourage vegetarianism and most Buddhists do not practice it. 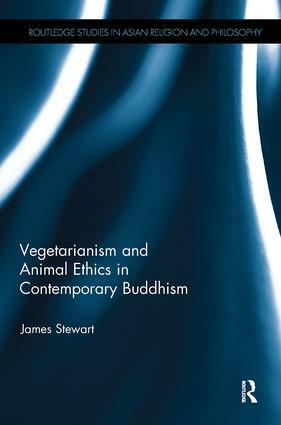 Using research based on ethnographic evidence and interviews, this book discusses this issue by presenting an investigation of vegetarianism and animal ethics within a Buddhist cultural domain. Focusing on Sri Lanka, a place of great historical significance to Buddhism, the book looks at how lay Buddhists and the clergy came to understand the role of vegetarianism and animal ethics in Buddhism. It analyses whether the Buddha preached a view that encouraged vegetarianism, and how this squares with his pacifism towards animals. The book goes on to question how Buddhist food practices intersect with other secular activities such as traditional medicine, as well as discussing the wider implications of Buddhist animal pacifism including vegetarian political movements and animal rights groups. Shedding light on a subject that, until now, has only been tangentially treated by scholars, this interdisciplinary study will be of interest to those working in the fields of Buddhist Studies, Religion and Philosophy, as well as South Asian Studies.